Here are some Quick and Easy recipes for hurried homemakers! Please share your recipes with At Home With Your Kids! Check out the recipes already shared here. If you have the same recipe but with a variation, please let us know. We can put it on the same page. It can be compared or even added too! We love to get recipes that are great for kids cooking! Some of my favorite memories are when my boys and I would do some crazy cooking. You can send photos of your homemade items and share and encourage those who might be new to the concept. LOL! 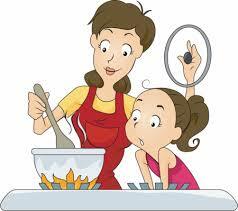 Check out our Cooking page as it has great hints for keeping the kitchen neat!